Gateway Psychiatric Services has been organizing medical and professional education conferences, symposia, and grand rounds lectures for over four years. We have worked hard to hone the planning process, and are able to smoothly coordinate every facet of program facilitation. Gateway Psychiatric Services designs its events to require the least amount of labor and resource expenditure on the part of the host organization or institution. Dr. Peter Forster, Clinical Professor of Psychiatry at the University of San Francisco, travels nationally and internationally to lecture and present innovative treatment tools and strategies in modern psychiatry . He is the Cluster Director for Emergency Psychiatry for the UCSF Residency Training Program. Past Vice President of the International Association for Emergency Psychiatry (IAEP), Dr. Forster has extensive clinical expertise in successfully treating a variety of psychiatric conditions including suicidality, bipolar disorder, psychoses, depression and anxiety . Dr. Forster is also an expert in managed care systems and designing and implementing psychiatric emergency services . Dr. Forster presents at lectures, medical staff meetings, grand rounds and has consulted for hospital and behavioral health systems. He is continually investigating the issues facing clinicians worldwide . Dr. Peter Forster may be available to speak to your organization. In February 1998, Gateway Psychiatric Services held the first Primary Care Psychiatry Symposium in San Francisco in conjunction with the University of California, San Francisco’s Office of Continuing Medical Education. Over 70 local primary care physicians attended this all-day symposium to learn how to recognize psychiatric disorders in their patients. Gateway Psychiatric Services organized and hosted a half-day symposium for 100 primary care physicians in Honolulu in June of 1999. This continuing medical education event was sponsored by the Institute for Behavioral Healthcare , the Hawaii Medical Service Association, and the University of Hawaii’s Department of Family Practice. And in April 2000, Gateway Psychiatric Services conducted an all-day symposium at the Alaska Regional Hospital in Anchorage. The 80 primary care practitioners who attended were updated on advances in diagnosis and therapy of psychiatric disorders. 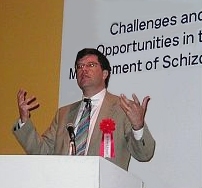 From October 1998 until April 2000, Gateway Psychiatric Services created and organized a series of twelve grand rounds lectures for San Francisco Community Mental Health Services psychiatrists. The dinner lectures addressed topics that the psychiatrists had chosen for their relevance to work in community psychiatry. Each dinner lecture was attended by approximately 35 psychiatrists, and demand was so high that every event had a waiting list. In September 1999, Gateway Psychiatric Services organized an all-day Suicide Prevention Conference in San Francisco. The conference, co-sponsored by United Behavioral Health, was attended by over 250 mental health professionals: psychiatrists, nurses, social workers and psychologists. In November 2003, Gateway Psychiatric Services, in conjunction with the American Association for Emergency Psychiatry and the International Association for Emergency Psychiatry, is organizing another all-day conference, this time devoted to the Suicidal Patient in Crisis. This conference will be attended by an international audience of emergency mental health administrators and clinicians. In the next two years California’s county mental health systems will have to make major decisions about information systems involving investments of millions of dollars in new technology, training and deployment. Most counties still rely on a mainframe application for billing that will no longer be supported after next year by Echo software. At the same time, counties are increasingly concerned about achieving the best outcomes from care and are investing money in a managed mental health infrastructure. In the context of these changes, the California Institute for Mental Health (the educational arm of the California Mental Health Directors Association) hosted a conference that allowed mental health administrators and information systems staff from around the state to get an update on the state of the art in information systems for mental health, and to meet with vendors from around the country. Peter Forster, MD, Tom Trabin, PhD, Thomas Stucke, and Lawrence Feinstein PhD presented. Vendors present included: Centromine, Inc., CMHC Systems, Creative Socio-Medics, The Echo Group, ePhysician, InfoMC, Integra, Integrated Healthcare Partners Corporation, Medipay, Inc., Raintree Systems, Inc., and Visionyze.com.